Different from other viral infections like Chicken pox, Molluscum Contagiosum may disappear without treatment from children after 12 to 24 months. While infected, your child may transmit this highly contagious virus to others. 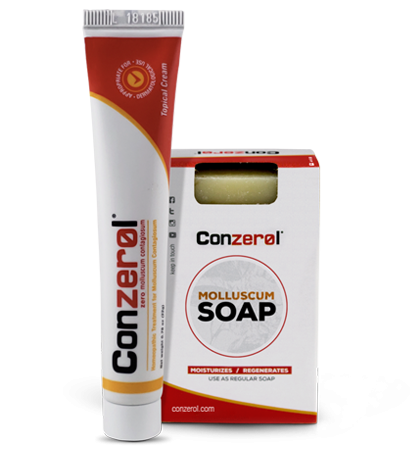 Conzerol’s formulation will bring Molluscum Contagiosum relief to your child. It’s fast, painless and is very safe. With Conzerol, your child can play and have fun again, without worry, in a few weeks -not months or years. Use Conzerol® with children from 1 year and up. Pictures provided by a real Conzerol® user. Results may vary*. Conzerol’s® formula inhibits the Molluscum Contagiosum virus, as well as stimulates the immune systems response of the human body. With Conzerol your kids can get back to their normal life fast, safe, and painlessly*. I was amazed to see many of my daughters bumps disappear completely within a week. We understand that having a child with Molluscum Contagiosum (MCV) can be very dis-heartening. Conzerol was pioneered by people having suffered what you are experiencing. Keep in mind that MCV is very common and many families have experienced or will experience this virus. You are not alone. Be encouraged! – With Conzerol it will pass quickly. We provide a 60-day money back guarantee for purchases of Conzerol® cream; this refund does not include handling & shipping expenses, Soaps, H202 Gel, and/or Probiotics. We understand the urgency to receive your order of Conzerol®, if you place your order before 11AM EST, your product will be shipped the same day (Does not include weekends, holidays, or natural disasters). If purchased after 11 AM EST, it will be shipped the following business day. You will receive your tracking number from 24 to 48 hours after your order is processed. We provide free shipping & handling in the United States and abroad. International orders may be charged an additional fee for shipping & handling.